Since the first mass production DirectX 11 GPU was introduced with ATI’s HD 5870 back in the latter half of 2009 many things have changed. First and foremost there are now 33 games that support DirectX 11. It seems that triple-A game developers have realized that DirectX 11 support is a key selling point on the PC platform. 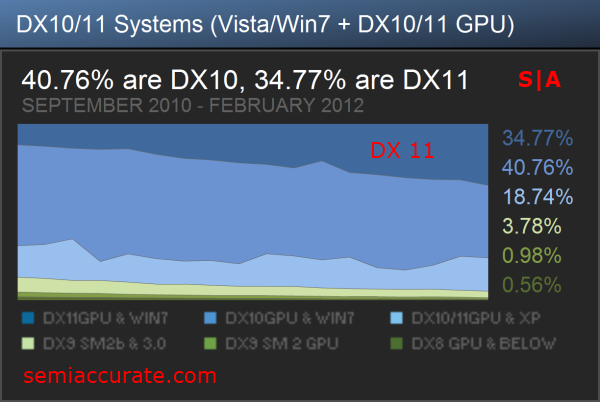 Other signs of DirectX 11’s constantly growing importance abound. If we look at the steam hardware survey we can see that almost 35 percent of users now have a DX11 graphics card, with ATI’s HD 5770 holding the crown for the largest installed base of DirectX 11 video cards. A common trend that can be seen just by scrolling down the list of DirectX 11 supporting games on Wikipedia, is that a significant portion of games released within the last year support only two graphics rendering options natively, Direct X 9.0c and DirectX 11 . Now some would point to this and say, “Everybody look, the consoles are dooming us Direct X 9.0c graphics with superficial DirectX 11 support.” And to a certain extent they’d be right. But what this trend is really showing is that developers are beginning to understand what they need to do to be successful on the PC platform. Let’s look at Crysis 2 as an example. The original Crysis was one of the best, if not the best looking DirectX 10 game ever released. It was a PC only title that offered support for the latest DirectX version and a decent graphical configuration menu at the time of its launch. Its successor, Crysis 2, failed in both of those respects. It was a multiplatform title that, at launch, only supported Direct X 9.0c graphics rendering, and offered very little in the way of configurable graphics options. Needless to say there was quite a bit of outrage when the game shipped in that state. Now, to Crytek’s credit they did release a few patches that alleviated most of these issues and added, however superficial, DirectX 11 support. But Crysis 2’s example really clarifies two points about the PC gaming market. The first being that a really bad case of consolitis can destroy even the most fanatical fan base, and the second being that at the very least triple-A shooters have to support DirectX 11 . Now there will of course be exceptions to these two points, but as a general statement those are two things that are very near and dear to the hearts (and wallets) of PC gamers. The Frostbite 2 engine is quickly becoming the poster child of DirectX 11 gaming. Already EA has seen fit to release two titles, Battlefield 3 and Need for Speed: The Run, on this engine and has promised at least two more titles, Medal of Honor: Warfighter and Command & Conquer: Generals 2, to come before the end of next year. The most interesting property of the Frostbite 2 engine is its utter lack of support for Direct X 9.0c on the PC. The developers of the engine, DICE, promised numerous times that it was built with DirectX 11 in mind. And when you compare it to DICE’s first DirectX 11 offering, Battlefield: Bad Company 2, it’s obvious that the DirectX 11 implementation in Frostbite 2 engine isn’t superficial. 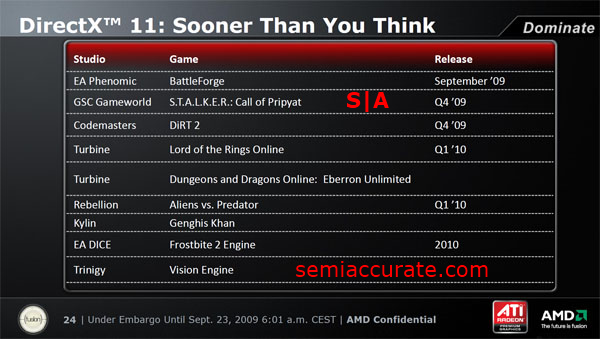 Even real time strategy games and MMOs have taken a liking to DirectX 11 . EA’s Battleforge was one of the first, with 2K’s Civilization V, and Sega’s Total War: Shogun 2 really showing that even RTSs can make use of DirectX 11 major features, like DirectCompute. Notably reviewers at Anandtech have found Civilization V’s texture decompression benchmark, which uses DirectCompute, to be a useful when judging the performance of DirectX 11 GPUs. The World of Warcraft, one of the largest MMOs in existence, acted as a poster child for the efficiency increases DirectX 11 offered over DirectX 9.0c. Using the DirectX 11 code path you can actually get significantly higher performance in WoW than you can when running under its normal DX 9.0c code path. The point that I’m making here is that DirectX 11 is at the very least, on the cusp of being accepted as a mainstream videogame feature. This is a world away from what the state of DirectX 11 was in late 2009. So with Windows 8 just around the corner and AMD’s HD 7000 series GPUs out in the wild I’m sure many of you are wondering about the next iteration of the DX API. DirectX 11 .1 is that next iteration and as you can probably guess it’s a mild upgrade from the original DirectX 11 specification. The biggest change that DirectX 11 .1 brings is support for stereoscopic 3D. Additionally, it brings new performance profiling tools and complier enhancements as well as a laundry list of other, relatively minor, features that largely bring it to parity with OpenGL. As of today, there have been no announcements of DirectX 11 .1 games to my knowledge. Although with the growing DirectX 11.1 install base it wouldn’t be surprising to see developers beginning to release DirectX 11 .1 patches for their games before years end.